I had hoped and planned to go to a fly-in last weekend, but the test pilot's schedule filled up, the plane needed to go down for maintenance to tweak her rigging, and I didn't have enough time to feel comfortable and safe solo. So with heavy heart, I sent word that I wouldn't make it. It was great fun, with reindeer and moose sausages, potato chips, soda, and one awesome woman brought cookies and cupcakes. We even had the madatory kid and/or dog underfoot, in this case an eldery Chow who was pretty laid-back about the whole thing. 1.) Hit the surface of the earth. 2.) Don't hit the dog. 3.) Maintain at or above 150 AGL while dropping the flour bomb. Note: this one was NOT mine. 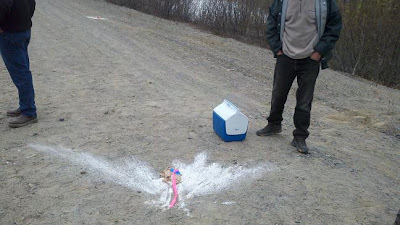 We didn't win, (there are some guys who are really good at dropping things where they want it), and if my takeoff could have inspired a good round of ribbing for putting in more aileron than needed for the calm wind below the treeline, well, the good folks were kind enough to give me a pass. The long flight home was faster than we'd planned, as we picked up a tailwind, and we were having too much fun to be bored. A few rain showers impeded visibility - it may only have been 80 miles. The airplane's down for a few days with paperwork, and mechanical problems - tweaking rigging, checking a rocker box cover that decided to leak oil, patching a few spots on the tailfeathers that may be old damage, or may be fresh damage from the gravel runways, converting temporary placards to permanent, and so on. It's been a good shake down. 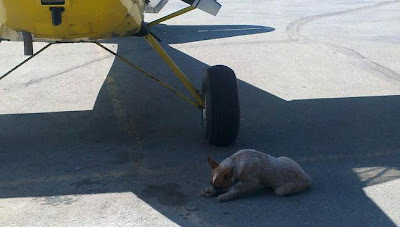 I love that last picture of the dog snoozing in the shadow of the plane. Jenny S has argued that Alaska is a lot like the Outer Planets in Firefly, and I always thought that the one thing the ship in that show was missing was a dog, so it makes sense that I'd approve of a dog hanging around old planes! That looks like fun. While there was nothing wrong with hanging around Goat Coffee on Sunday afternoon, I'd rather have been watching the 'bombing' runs. Sounds like your ol' gal is just about ready to go. I'm glad she's pulling together well. Sounds like things are coming together nicely! Patriarch - didn't realize Chitty was your old plane! Small world! If it's any consolation, the engine sounds great and she's flying well, for all the peeling paint on her cowl.